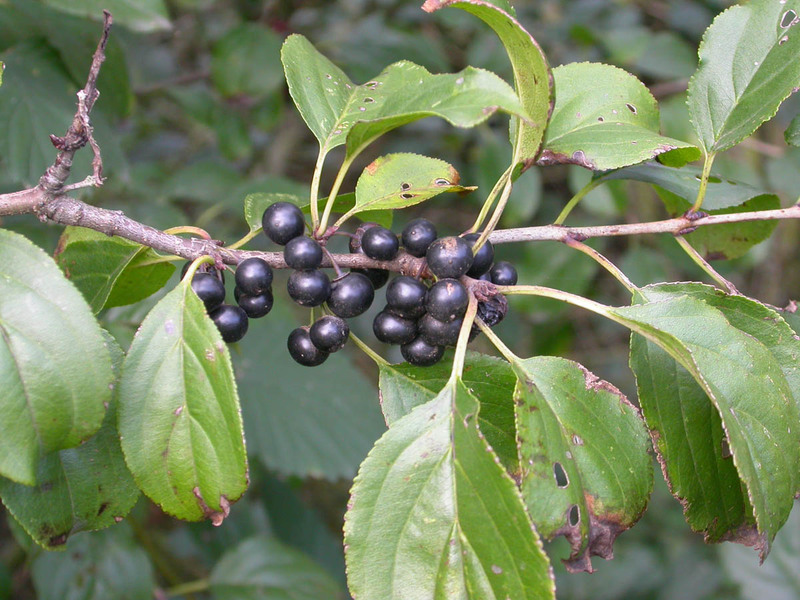 Rhamnus cuathartica.Copyright © 2009 by P.B. Pelser.phytoimages.siu.ed (Accessed 7/2014). Rhamnus cathartica is a shrub to 6 m tall, some branches ending in short thorns, (thorns appearing to be in branch axils), twigs brown to gray, leaf scars often nearly opposite; winter buds with overlapping scales (Harlow 1946), stipules present, small, linear, hairy, eventually deciduous. Leaves opposite to subopposite, sometimes alternate, stalk 0.6-2.5 cm, blade broadly elliptic, to 4-7 cm long to 3 cm wide, tip pointed or blunt base rounded to slightly lobed, leaf lateral veins usually 3-5 on each side of midrib, curving sharply upward and inward near leaf tip, dull, dark green above, slightly paler green below, margin finely blunt-toothed. Flowers 4-parted, yellowish-green, sexes on different plants (dioecious), appearing with leaves, very small, in clusters of 2-5 on new growth (Rehder 1986), May. Fruit black, fleshy, persistent through fall through winter (Zouhar 2011) bird-dispersed. Habitat: Disturbed woodlands, fields, disturbed wetland edges, may form dense thickets (Zouhar 2011). Often invasive. Notes: Senescent leaves high in nitrogen (2.2%), decay quickly, possibly increasing soil nitrogen under buckthorn stands relative to that under native plants, making the site more hospitable to increased buckthorn growth (Heneghan et al. 2002). Listed as invasive in several states (USDA, NRCS 2010). May be toxic (Kingsbury 1964).